Join the discussion on our forums! Come discuss Twilight Flamecaller over in our dedicated Twilight Flamecaller discussion topic. Battlecry: Deal 1 damage to all enemy minions. Make sure you summon a Twilight Marshmallowcaller too! Mmmm Mmm Mmm!! Amazing in arena. Almost always useful! Golden version gives extra value? There recently was a thread with the 15-20 cards that involved 1/1s in the new set. This card could have a use against them; however,the body is too weak. I'd rather have a 1/3. I like this card. It's arcane explosion + body. Seems useful. I've only ever seen Arcane Explosion in decks with Malygos and/or Dalaran Aspirant. Since this can't be boosted by Spell Damage, I imagine it'll see even less play in Constructed. As for Arena, it seems pretty solid. 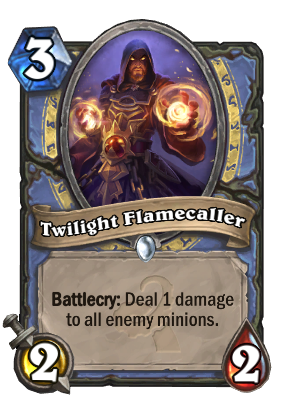 Mage could've used shadow word: horror or spreading madness a lot more than this for the early game, but it's still a very good card. THIS IS GOING TO BE AN AMAZING GOLDEN!!! Arcane explosion in current meta is pretty much must-have unless you playing 2xFlamewakers already. It helps survive muster4battle with buffs and secrets in following turn, good vs zoo, somewhat useful against egg druids, even hunters. This is better than arcane explosion in most cases, but worse than Ravaging Ghoul for warrior. That card just nuts. Are you a time traveller? ?